Let’s continue these next few weeks riding on the east side of Edmonton. Start from Colchester Elementary School, and make a counter-clockwise circuit south and east of the city. 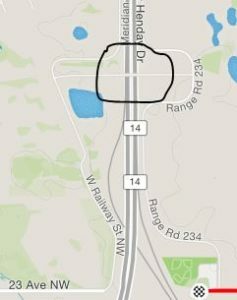 Edmonton has a “secret” overpass across Anthony Henday Drive that let’s you ride to this start location? If you can deal with a short stretch of gravel, then take 23Ave to W. Railway Street. It will loop you over Anthony Henday onto RR234 just east of Colchester School. This overpass is closed to all vehicle traffic. 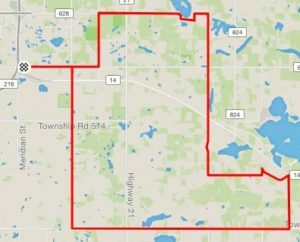 Use this route if you’re riding to our start location. Or, if it’s easier for your own parking, you could park in The Meadows district, and then make the short ride to Colchester using this overpass. Please watch Twitter for ride rain-out / snow cancellations.